Dave is away for a week and a half! He is in Vancouver with his family and I am home… and this weekend I was home ALONE! BUT… it was fantastic. I went to the gym, walked the dogs, caught up on True Blood, Big Brother, Weeds, AND watched GIRLS for the 2nd time around! What a relaxing weekend. While I was vegging out, I decided to clean my parents candy cabinet. While doing this, I found a bag of White Chocolate M&Ms from Easter that i had bought and never did anything with. 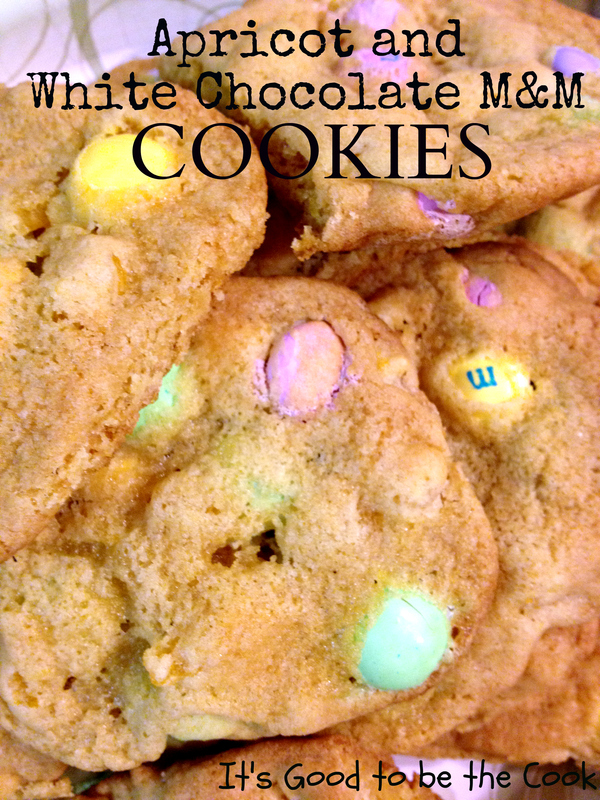 I found this to be the perfect opportunity to make a new type of M&M Cookie – I lovvvvve them! I started off with a Southern Living Chocolate Chip Cookie Dough recipe… halved it… and added some chopped up dried apricots. We had a huge bag of apricots in the house… it was such a good batch I figured it would be AMAZING in cookies. I was right. 2. Beat the butter and sugars in a mixer until creamy. Add the egg and vanilla and beat until it’s blended together. 3. Meanwhile, mix the flour, baking soda, and salt in a small bowl. 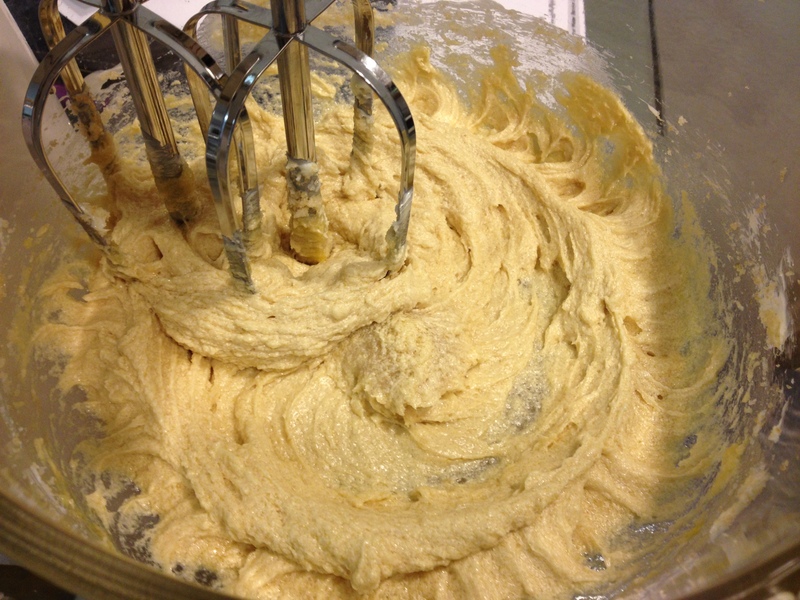 Take the flour mixture and add to the butter mixture a little at a time until it’s just blended together. 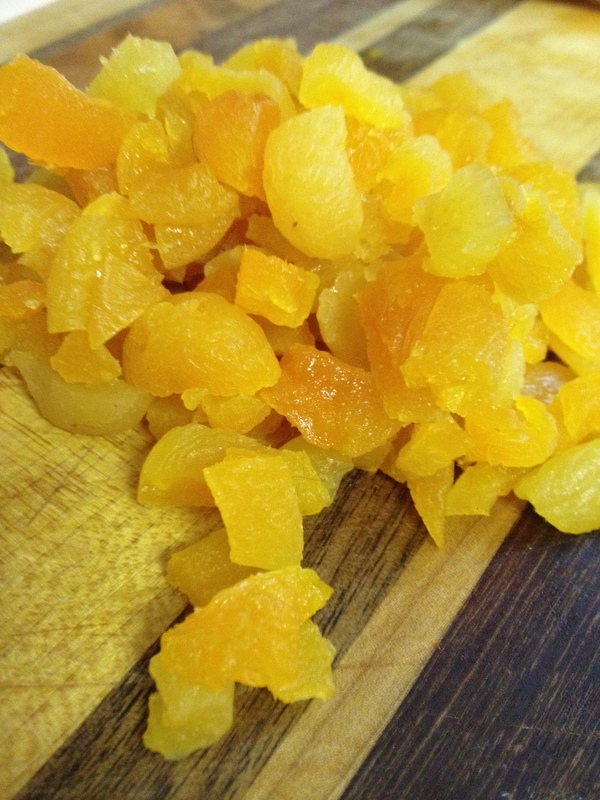 Add the dried apricots and continue to blend with the mixer. 4. 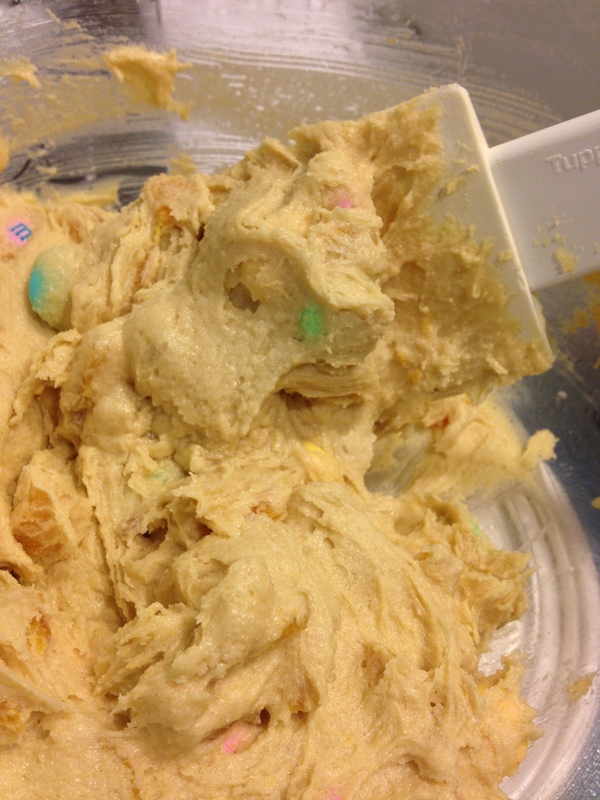 Stop the mixer, get out all of the dough from the beaters, and with a rubber spatula or spoon, mix in most of the M&Ms. For larger cookies, use a Tablespoon to drop the cookies onto the parchment. 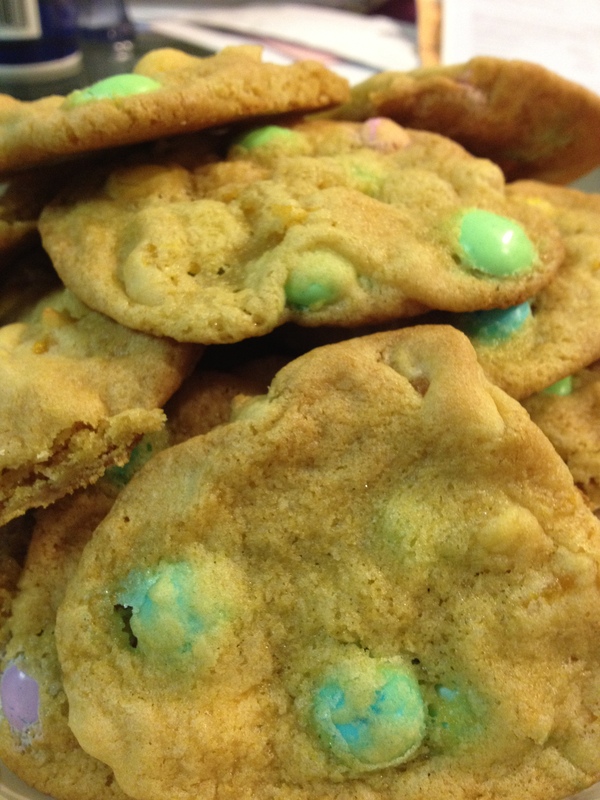 For smaller cookies, use a heaping teaspoon to drop them. 5. Bake in the oven for 10-15 minutes depending on how you like them and the size. 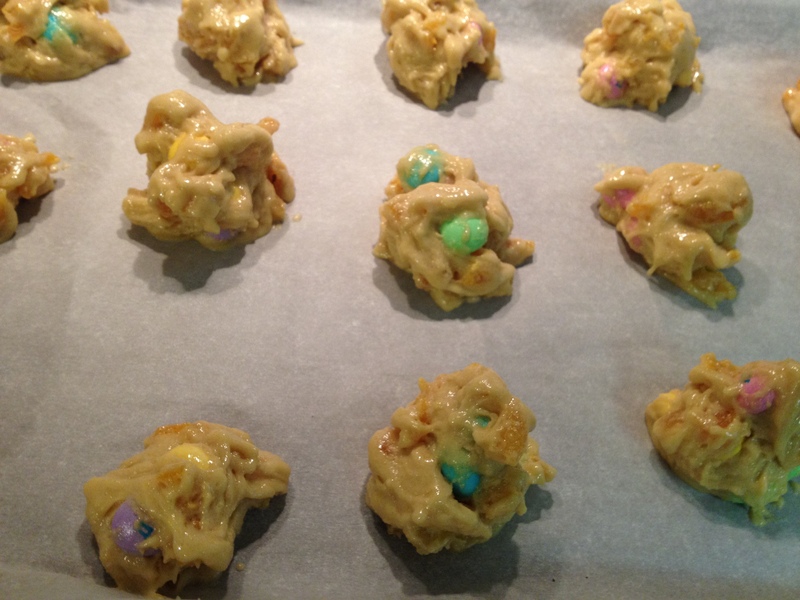 I put mine on timer for 8 minutes, then added a few M&Ms ontop and let them bake for another 5 minutes or so. Remove and let them cool completely on wire racks. Mix and mix and mix and mix! BJ’s has my favorite dried apricots, they’re always really juicy and sweet. 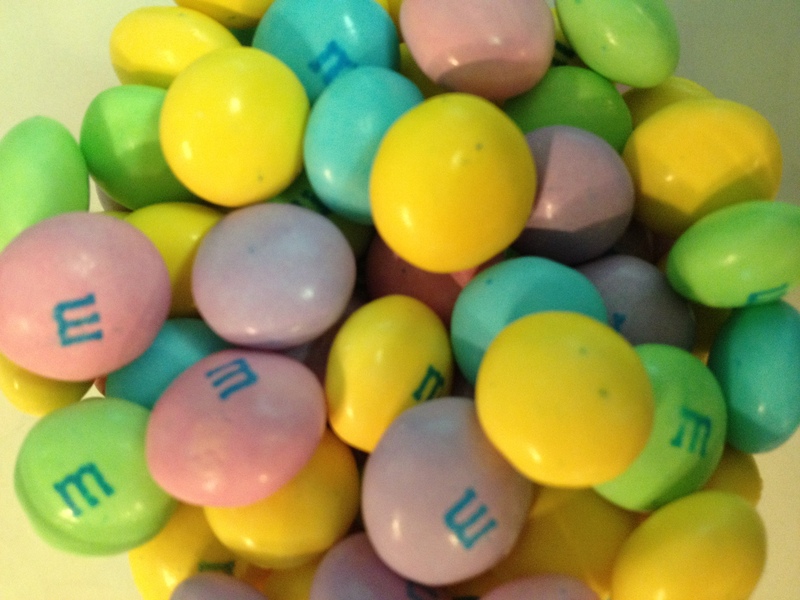 You don’t want the M&M’s to break apart so stir them in, don’t use the blender. I THOUGHT these would be small but they were pretty big! These babies were awesome. I somehow managed to only eat one cookie this weekend (besides the one-cookie’s worth of raw dough I ate before cleaning out the bowl) so I brought them to our family BBQ on Sunday night. My Poppop ate one cookie then snitched a few bites of another! They really were a big hit! I will also share with you a really helpful hint I just learned from my sister: Store fresh baked cookies with a piece or two of white bread underneath. It will keep them nice and chewy and moist. I did this for these cookies and it REALLY worked. Meanwhile, I ate another cookie tonight after our BBQ, and I can’t even let my favorite taste-tester try them! He’s all the way across the country 😦 Dave’s family is from Vancouver, BC and he is spending some time with them. I’m so jealous, Vancouver is THE MOST BEAUTIFUL city on earth, and his family is so awesome too… I wish I was there! I am now obligated to finally write my “Travel” post about gorgeous Vancouver before Dave gets back next Sunday… get ready!